It’s a place that winter-welcomes you with a sign reading Seasoned Greetings but it’s a literal welcome because the Culinary Institute of America wants you to share the fare that its students are learning to cook – which, last Tuesday, meant a Tuscan extravaganza of hearty peasant dishes served in its Ristorante Catarina de Medici. 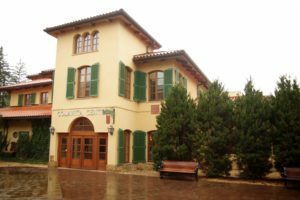 This restaurant is within the school’s 15-year-old Colavita Center for Italian Food and Wine, located in the midst of the school’s Hyde Park (Dutchess County, NY) campus, a structure built to resemble a Tuscan villa and offering an emphasis on Mediterranean cooking that veers from the culinary epicenter of France (although it’s worth remembering that the restaurant’s Florence-born namesake spent 12 years as Queen of France). Chef Giovanni Scappin, a Hudson Valley restaurateur who is also a professor at the school, helmed a luncheon on Nov. 29 that focused on peasant fare – the cucina povera that defines the Tuscan way of making a meal out of what’s living outside your window. And even as the weather gets colder, there are dining options, as this luncheon demonstrated. The dining areas in the restaurant are large and elegantly appointed. A large pass-through window at one end of one of the rooms looks into the kitchen and also serves as a counter for afternoon pizza service. White-linen tables cluster around an artificial olive tree; wall sconces take up the olive-branch motif. Terra cotta floor tiles round out the décor. Student servers wear a classic outfit of casual black and white, with white aprons tied at the waist. We were promptly visited by one such server bearing a bottle of Prosecco to give our meal an appropriate launch. We were handed a menu with recipes when we were seated, and the first course, a trio of crostini, featured a chicken-liver preparation I favor. Which merits a digression. 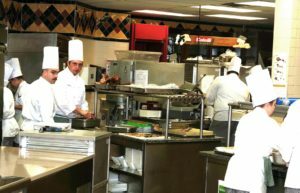 I learned to make French-style pâté while working for an Italian chef in a continental restaurant. 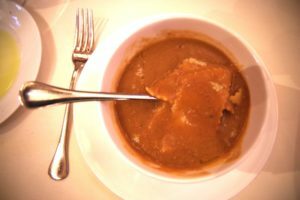 The recipe featured what was practically a one-to-one butter-to-liver ratio, which makes for a delicious, if caloric, treat; the Italian version I later learned and now prefer has a ratio of about one to four, but the livers are simmered in Marsala, which gives them a more lively flavor. And this was the recipe we encountered. Rounding out the plate were crostini with crabmeat over gochugaru (Korean hot red pepper)-enhanced yogurt, and with a sage-seasoned chickpea purée. You and I are accustomed to the likes of elbow macaroni as the pasta in pasta e fagioli, but Scappin’s recipe uses maltagliata (Italian for badly cut), which are the scraps left over after trimming other pasta preparations. The garlicky tomato base was satisfying on its own; the added beans were a bonus. In a typical Tuscan meal, you’d head from pasta to meat, but we had the delightful coastal intrusion of cod for course number three, lightly sautéed and topped with a tomato concasse (from the French concasser, to crush or grind) flavored with olives, capers, and mint. All of it presented on a bed of soft polenta, which nicely complemented the easygoing texture of the fish. The pork roast that followed began its kitchen journey with an overnight stay in brine before its trip into the oven; the juice it yielded was reduced to a tangy sauce. Sautéed kale and roasted rosemary-scented baby potatoes rounded out the dish, which brought us well past the point of sufficiency. 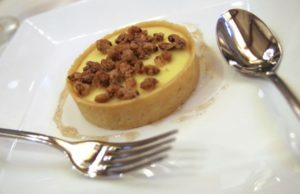 Then a lemon pine nut tart appeared, borne by the efficient server fleet, and the combination of tart, sweet pastry cream and delicate crust was irresistible. The one area in which this restaurant, like so many others, falls down is in tea service. My wife places her order with muted expectations; even so, we hardly expected the Culinary Institute of America to put down a cup of hot water and a bag of Lipton’s – especially when teapots are available in their very own gift shop and the G.H. Ford Tea Company is right nearby. But the lemon tart had mellowed us. And, anyway, I was sipping coffee. Even with the slanting rain outside we could imagine ourselves back on a sunny Tuscan hillside, ready to inspect the groves of olives and grapes. 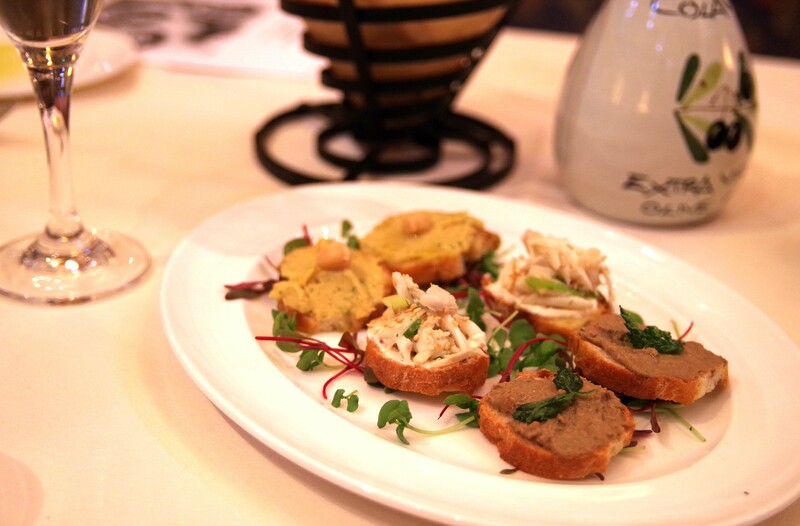 “It’s part of the culture of Italy,” says Scappin, “finding comfort in food.” With the onset of winter, he explained, the restaurant offers the community a series of banquets highlighting different aspects of Italian cooking. The Tuscan luncheon was the kickoff; to follow are a Black & White Truffle Dinner at 6 PM Thursday, Dec. 15, featuring a five-course meal paired with appropriate wines, and Cucina Regionale Piedmont, with a menu including bagna cauda, potato gnocci, zuppa di cipolla al vino rosso, and mattonella al gianduia, also paired with regional wines, at 6 PM Tuesday, Feb. 28, 2017.